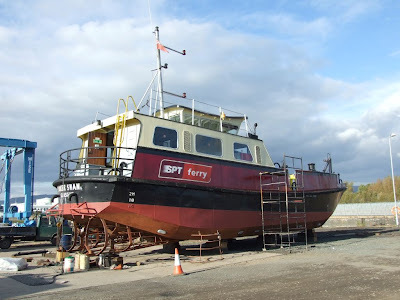 One of the two little ferries which are operated by Strathclyde Transport and run between Yoker and Renfrew is currently undergoing its annual overhaul and survey at the River Clyde Boatyard at Clydebank. YOKER SWAN was built at Ardrossan in 1984 and has been employed on the short service across the river ever since. Recently, there have been suggestions that the ferries, now considered to be approaching the end of their useful lives, could be replaced within the next couple of years. There has even been talk of building a footbridge!